The scary hauntings associated with underground railroads are tales of desperation, betrayal, and terror. Runaway slaves moving along a network of secret stations sometimes died during their hopeful journey to freedom. The ghosts of these tormented souls often haunt the places where their escape came to a tragic end. Many people risked their lives helping runaway slaves escape before and during the Civil War of the United States of America. This secret network of routes traveled through almost every state. Using the cloak of night, conductors guided slaves safely through the countryside. People offered their homes and farms as safehouses during the day. These stations had secret rooms located in the attics and basements. Many had underground tunnels. The emotions ran high, especially when being pursued by bounty hunters and slave catchers. Many hiding places were often the scene of tragic deaths and sometimes left behind restless spirits. Almost every state has a ghost story of runaway slaves hiding in a house. Also known as Trinway Mansion, Prospect Place is a house haunted by those who lived on the farm and the slaves who were trying to escape to freedom. The lineup of ghosts is very impressive. The basement of the mansion was a stopover for runaway slaves on their way to Canada. A bounty hunter haunts the barn where farmhands hanged him. A sick little girl fell to her death from an upstairs bedroom window. It was winter and the ground was frozen solid so her body was kept in the basement until a spring burial was possible. It's said the child wanders through the house and those who venture into the basement often hear her crying. The child's mother sat in the basement by her body until she developed pneumonia and died. Her spirit can often be found in the little girl's bedroom or the basement. Anna Adams-Cox, an abandoned wife, searches the property for her missing husband. The missing husband, George, is seen roaming the house. A slave, who died in the house, often stands watch over the little girl's body in the basement. The Hannah House haunting soon began after runaway slaves hiding in the basement overturned a lantern. Several became trapped by the fire and burned to death. It's been reported that the upstairs rooms reek of the smell of dead bodies coming from the attic. Perhaps the burned slaves were hidden in the attic until they could be buried. Moans and wails echo through the house while doors open and close by themselves. The Governor's Mansion was at one time a station for runaway slaves. A tunnel led from the basement to the St. Jones River, affording a secret passage to the safehouse. People have reported seeing ghosts ever since the mansion was built in 1790. The town of Alton is considered one of the most haunted places in America. The Hanson Home, which later became the Enos Sanitarium, is known for a variety of paranormal activities. When it was built in 1857, Nathaniel Hanson had underground tunnels and rooms carved out of the bed of limestone. Many slaves died trying to make it across the Mississippi River. Others succumbed to disease, starvation and injuries. 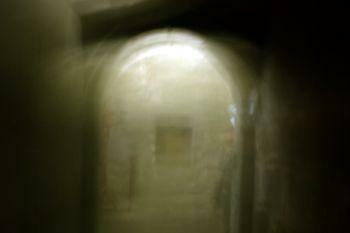 It's believed their restless spirits haunt the building and tunnels. Claimed to be the state's most haunted place, Hickory Hill was once an underground railroad station and dubbed, Old Slave House. This station wasn't like the others. The owner, John Hart Crenshaw, operated a reverse underground station. Instead of aiding slaves to freedom, he tricked them to his home and sold them back into slavery. Slave catchers brought slaves to him and Crenshaw sold the unsuspecting runaways to the salt mine owners. Slaves were often lured away from plantations and farms on the promise of freedom only to find themselves victims of Crenshaw's greed. He built an underground tunnel leading from the basement of his house to the river so the slaves could be transported in and out undetected. In the back of his house was a larger entranceway to the basement where entire wagons could roll inside to be loaded and unloaded without anyone seeing. Operating under the threat of death in order to free slaves meant the locations of many stations were lost to secrecy. Some were uncovered during renovations while others were recalled by local families. With the history of terror and deep emotion, it's not surprising many underground railroad locations are subject to hauntings.